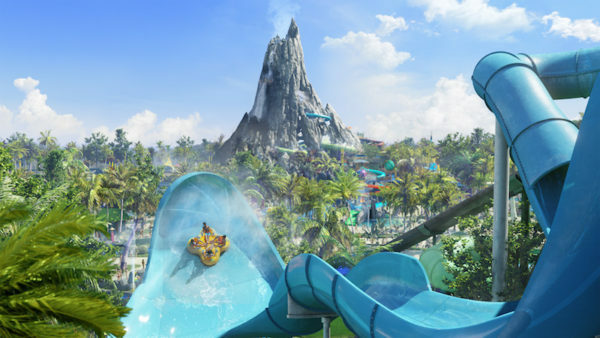 Universal Orlando Resort has opened a brand new water park called Volcano Bay. I hit the park with 7 kids ranging in age from 7 to 16 to give you all the best tried and tested Volcano Bay tips. 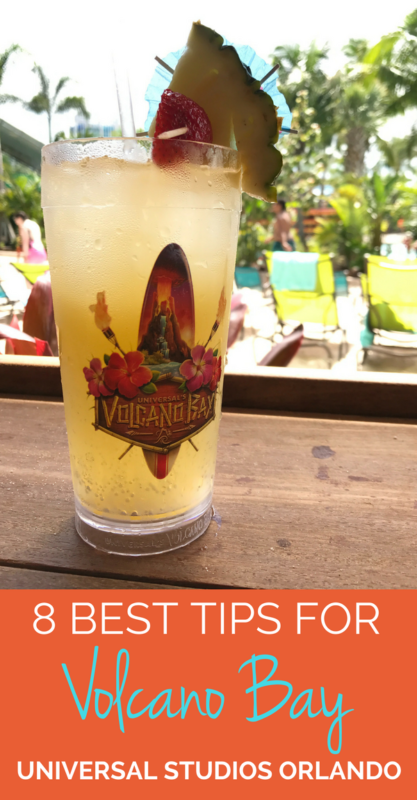 Plus, I rented a cabana to tell you what you need to know about the Volcano Bay cabanas. Ready to head to the park? Don’t go without reading this first. 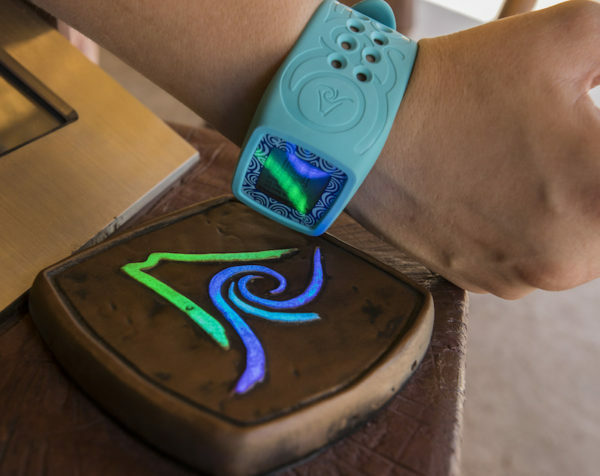 A TapuTapu is a wearable band that lets you virtually stand in line for a ride while you explore the park. The good – it works. 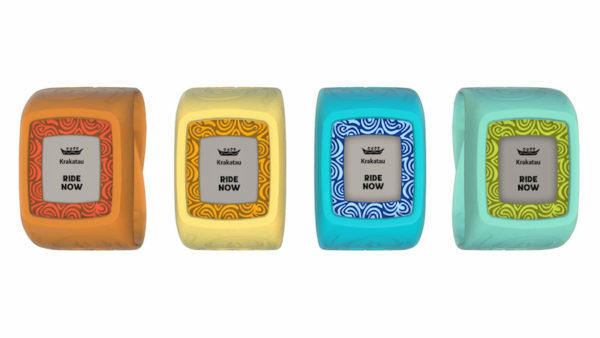 The bad – you can only sign up for one ride at once and the bracelets are easy to lose. Hilariously, the teens in our group lost them much quicker than the smaller kids. If you lose your TapuTapu, you can get a new one for free by showing your park ticket. When entering the park, make sure to write each family member’s name on their specific ticket to make the process of replacing the TapuTapu easier. You won’t lose your place in line but the process can take a while as a lot of people find that the TapuTapus fall off. I rode over 14 rides and spent hours in the lazy and active rivers without losing mine or my daughter’s which I chose to wear. Going forward it looks like Universal will be modifying the design to make the bands more secure but in the meantime hold on tight to yours! 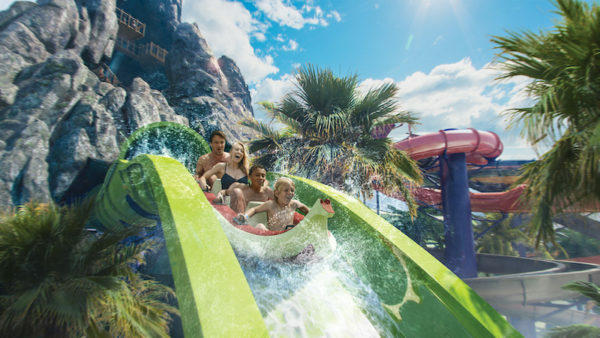 Volcano Bay offers some of the best and biggest waterslides in the world. Everyone walks in the park points at the volcano and says “I want to do that”. The reality is that the 3 major slides from the top of the volcano are terrifying. As a coaster fanatic, I had to convince myself to try them to satisfy my pride while impressing my kids. The line for the Ko’okiri Body Plunge can get quite long. Save some time by walking your kids half way up the steps to see if they will even do it. My Hulk coaster riding kids started shaking around the 4th flight of stairs. The slide features a 70-degree fall through a drop door and takes 7 seconds start to finish. It’s 125 feet high. Instead, line your family up for some equally amazing rides like the Krakatau Aqua Coaster and the Honu of the Honu ika Moana. By 4 o’clock on the day we visited, the lines for all the drop slides were less than an hour wait and after 7 pm, they were less than 20 minutes (meaning you could walk right on). This is a big one if you have small kids. There are two rivers on the property and they are not very well signed. We entered the fearless river unknowingly and it was a disaster. If you have kids under 10, make sure they only enter this river with one on one supervision. Entering and exiting the river through the crowd is the hardest part. The remainder of the river is incredibly fun. If you wait until after 4 pm, the river is much less busy. It becomes easier to handle more than one child at a time. We spent hours in the fearless river as the crowds filed out of the park near dinner time. Volcano Bay is very popular. It’s not only brand new, but it’s also frankly the best water park I’ve ever seen and one of the best amusement parks. Don’t expect to see it without crowds for a few years if ever. Still, most people don’t want to get wet too early or too late at night. The key to Volcano Bay and the best of my Volcano Bay tips is to go closer to 3 pm and stay until closing. On-site resort guests of Universal Orlando are given early access to the park and it is worth getting up early to get a jump on the free seating and shorter lines. Check out 12 amazing reasons to stay at Loews Portofino Bay Hotel if you are looking to stay on property. Going in the afternoon and staying late has the same effect. We expected to spend 3-4 hours at the park and were in the park for over 10 hours. We were able to ride multiple rides without a wait from 7 pm until closing. 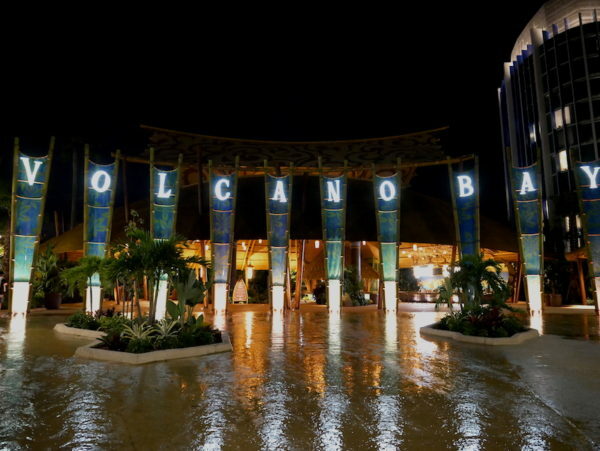 Volcano Bay is Polynesian themed and the names of the attractions can be confusing. The most confusing of the attractions are the two ika Moana slides; the Honu (turtle) and the ika Moana (whale). To be clear, the turtle slide is BLUE and the whale slide is GREEN. They are right next to each other. To add to the confusion, the signs for the Honu and ika Moana are currently reversed. The Honu sign says the slide is for 4 riders which is actually the ride information for the ika Moana. The Honu actually seats up to 5 riders. Both are fun so riding either is worth it but we had ongoing arguments within our group about whether we were waiting to ride the blue or green slide. I rode the Honu 6 times and frankly would have happily spent the day just riding this one awesome attraction. Most people I spoke to listed the Krakatau Aqua Coaster as the best ride in the park. It is worth monitoring the wait time to ride the Krakatau more than once. Most of the other slides are easy to ride at least once, so if you are only going to do one long wait, you should pick the Krakatau. We canceled some of our other wait times when the wait time for the Krakatau dropped to under 60 minutes. The wait time was often less than the stated wait and we rode the Krakatau 4 times in 1 day. While the TapuTapu can be a little confusing, the concept is genius. Basically, you can explore the entire park in the time you would normally be standing in a line. We played in the many pools and rivers, spent time relaxing and then headed to the rides which never had more than a 10-minute wait in the actual stand in line portion of the line. The TapuTapu makes the park much more manageable with kids. Don’t get frustrated when you first begin using it. We found there was always a slide or two with less than a 20-minute wait which meant you could ride without using your TapuTapu. While you needed to tap into the ride, it did not affect your wait time or bump you out of line for your next ride. We were able to ride about 6 rides by simply walking up to the ride. Once you figure out the system, you’ll appreciate having the time to feed your kids, put up your feet and even enjoy a Polynesian cocktail. You have 1 hour from the time your TapuTapu says “Ride Now” to get in line, don’t stress about rushing through your meal to get there immediately. There are currently two Express Pass options at Volcano Bay. The Universal Express PLUS Pass allows you to ride all participating rides at Volcano Bay once. The cost of the Universal Express PLUS pass starts at $39.99 a day and is not transferable. Guests can also choose the Universal Express Pass at a lower cost of $19.99 a day. One thing to note is that the Express Pass allows guests to skip the virtual wait but when you enter the line, you will still wait with all guests whose tapu tapu have told them it is time to line up. Waits can still be over 30 minutes with the Express Pass. 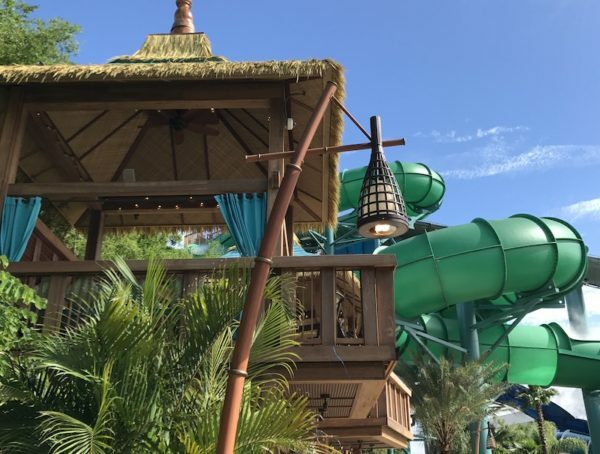 The best way to experience Volcano Bay is with the Volcano Bay cabanas. The bigger your group, the better the deal. The following review talks about the positives and negatives of our experience. I want to be clear that despite some small issues that need to be improved, I will still book a cabana every time I visit Volcano Bay. Without it, I believe we would not have been able to stay in the park as long as we did. I also think the cabana helped us schedule our day better while being far less stressed out. 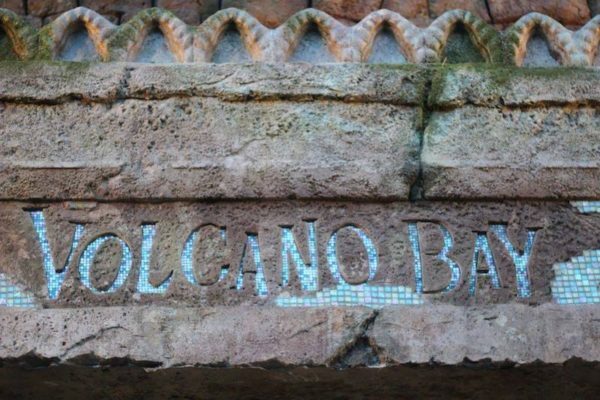 Here is exactly what you need to know before booking Volcano Bay cabanas. It is not easy to rent Volcano Bay cabanas. The reason for this is two-fold. First, there is mass confusion as to when you are allowed to book a cabana. Second, they are very limited in numbers. Currently, you can call (877) 489-8068 to book a Volcano Bay Cabana through September 30, 2017. You may have to call more than once to get the booking completed. Before even bothering to consider a family suite cabana at Volcano Bay, know that there are only 2 in the whole park. The difference between a single cabana unit versus a family suite cabana is simply size. For a little extra money, you can fit far more people (up to 16) in a family suite cabana versus 6 in a single cabana unit. If you cannot get a family suite cabana consider booking two single cabana units on top of each other or next to each other for virtually the same experience. The only issue is that booking two single cabanas will be almost double the price of booking a family cabana. Single cabana Units start at $159.99 a day plus tax. Family Suite cabanas start at $299.99 plus tax a day. Do not expect that to be the actual cost of your cabana. Single cabana units are more likely to cost upwards of $449.99 a day and family units are priced at over $649.99 a day. The cost of the cabana also depends on location and whether you would like an upper or lower unit. We had one of each. I would recommend the lower cabana as they are more shaded and you are better able to supervise your kids. There are several benefits to booking the Volcano Bay cabanas. 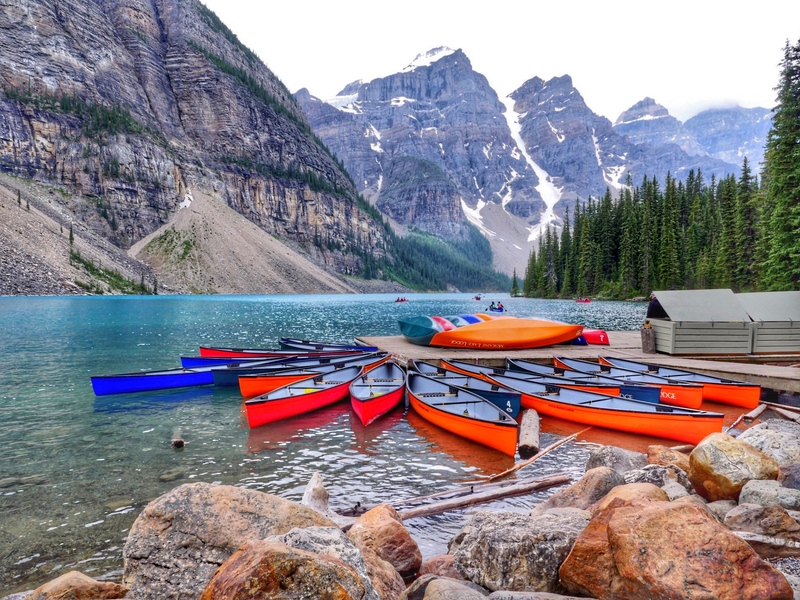 Primarily, it is the perfect home base for your day. The cabana comes with water, towels and a large locker. You not only have plenty of seating in your cabana but are allowed to save some of the free seating in front of your cabana for sun tanning. 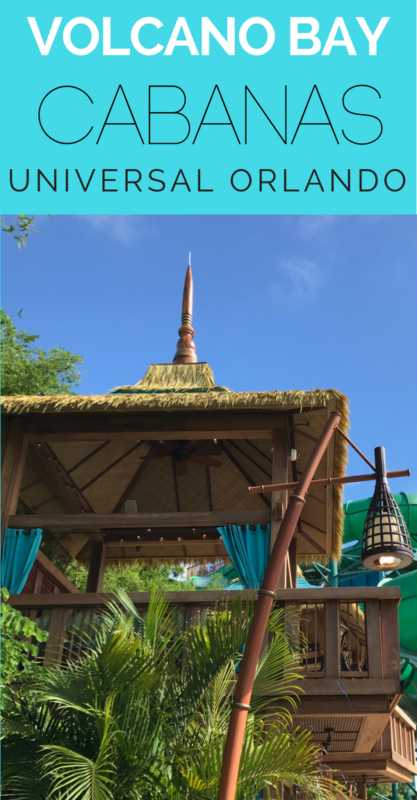 Another major benefit is that you can schedule your rides on your TapuTapu from your cabana instead of needing to walk to the individual ride. This saved enormous amounts of time and energy. 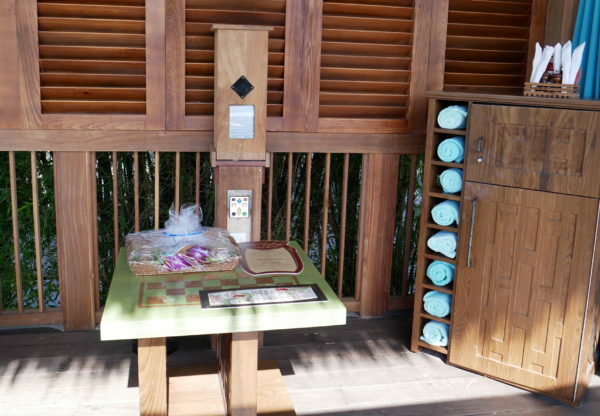 Each cabana comes with an attendant whose job is to refresh towels and help keep your cabana clean. You are also assigned a server who serves drinks and food. Volcano Bay is a brand new park and frankly, the Volcano Bay cabanas are currently not very well run. The structure itself is cool, shaded and comfortable. If that’s enough for you, I would feel comfortable advising you to book one. Where we experienced problems was with the cabana service. 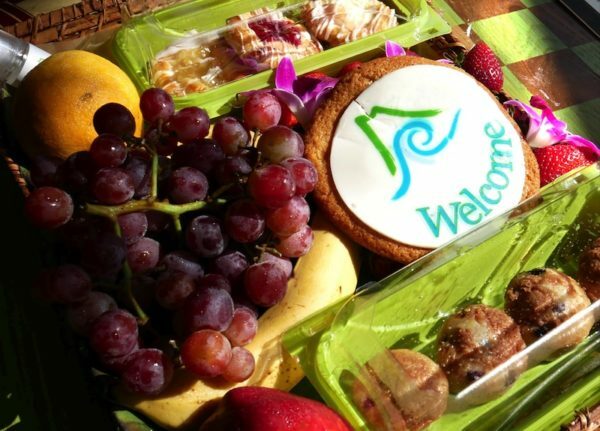 Our fruit basket was laid out hours before we arrived and set out in the sun. Most of the baked goods were unedible. We ran out of water around 3 pm and it was not replenished. While we had a number of towels, we were not able to trade-in for dry ones during the day. The general wait time for a drink in our cabana ranged from 45-minutes to over an hour and a half. Some of our food took upwards of 2 hours to arrive. In one case, we were informed after a 2-hour wait for sushi, they no longer had any in the park. The final issue is that you check into your pre-paid cabana, you need to wait in the same line as everyone booking any paid seating, renting towels and needing new TapuTapus. Thus, your cabana check-in can be over 45 minutes to an hour, just to be told which cabana is yours. The quick fix is for Universal to make a separate line for cabana and premium seating check-ins. Hopefully, this will happen soon. I would say yes. The cabanas do not cost much more than the premium seating which is two shaded seats with a smaller locker. We were able to stay in the park for hours as we had plenty of shade and a place to rest. I hope Universal quickly works out the service kinks because the cabanas themselves are amazing. Volcano Bay is unparalleled as a water park. Universal wanted to build a third park and the world’s first water theme park. I truly believe they have outdone themselves. 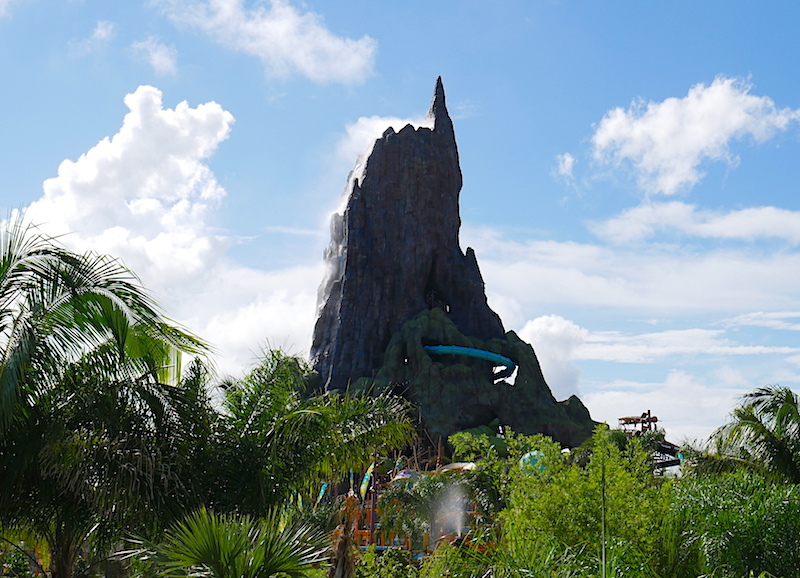 While it may be frustrating while the kinks are worked out, you should not hesitate to head to Volcano Bay. Take it from me, ride the Krakatau Aqua Coaster early because you are going to want to ride it often. Due to the fact that no cameras are allowed on the rides, the ride photos and TapuTapu photos in the post were kindly provided by and are credited to Universal Orlando Resort. I was a guest of Universal Orlando Resort.